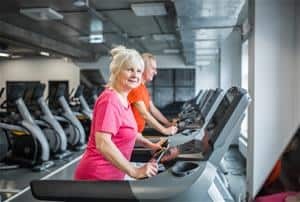 Can the Negative Cardiac Effects of Sedentary Aging be Reduced? The participants who were randomized initially in this study were 29 men and 32 women, and they ranged from 49 to 55 years of age. Around 80% were white. Eligibility included sedentary status, defined as not exercising for 30 minutes three times a week. Other factors which led to exclusion were the presence of hypertension, obesity, untreated hypo- or hyperthyroidism, obstructive sleep apnea, chronic obstructive pulmonary disease, tobacco use during past ten years, coronary artery disease, or structural heart disease. The exercise protocol was a progressive individualized training plan in which the exercise training frequency, duration, and intensity were increased over time. An exercise physiologist met with each participant every month of the trial. The initial program was three 30-minute sessions per week, which progressed such that by six months participants were training 5-6 hours a week. This level was maintained until month ten, at which time an individual maintenance plan was developed. To facilitate participant preferences, a variety of exercise including treadmills, elliptical trainers, running on trails, cycling, and swimming was allowed. Strength training twice a week was also added. The attention control group was prescribed a combination of yoga, balance and strength training three times a week for two years. Both groups kept activity logs and wore Polar heart monitors to document their compliance with the protocol. Interestingly, the compliance to this rigorous high-intensity training was 88%. The results of reduced left ventricular stiffness in the exercise group provides exciting guidance for helping to reduce the risk for subsequent HF in middle-aged adults who have had sedentary lifestyles. Yet the limitations of the study must be acknowledged in attempting to use for practice or design subsequent studies. For example, the participants were rigorously screened and volunteered for the high-intensity regimen, which may not apply to adults in general. Additionally, the small sample size and lack of diversity limit the generalizability to other racial groups. Nevertheless, the results are encouraging for an endurance type training program that negates the aging process, helps preserve ventricular compliance, and supports exercise guidelines.